Director – Ernest B. Schoedsack, Story – Ruth Rose, Photography (b&w) – Eddie Linden, J.O. Taylor & Vernon Walker, Music – Max Steiner, Chief Technician – Willis O’Brien, Sets – Al Herman & Van Nest Polglase. Production Company – RKO. Carl Denham is facing creditors, bailiffs and financial ruin over the King Kong fiasco. He flees New York aboard Captain Englehorn’s freighter. In Dakang, they meet the disreputable Nils Halstrom who originally sold Denham the map to Skull Island and now tells them about a vast treasure also hidden there. Joined by stowaway Hilda Petersen, an American singer that Denham befriends in Dakang, they set forth to Skull Island but are abandoned there when Halstrom inspires the crew to mutiny. On the island, they then encounter Kong’s son. King Kong (1933) was an enormous hit. Every success, as Hollywood thinking goes, requires a sequel and The Son of Kong was rushed into production, reuniting most of the key players and personnel from King Kong – director Ernest B. Schoedsak, writer Ruth Rose, musician Max Steiner, special effects artist Willis O’Brien and stars Robert Armstrong and Frank Reicher. 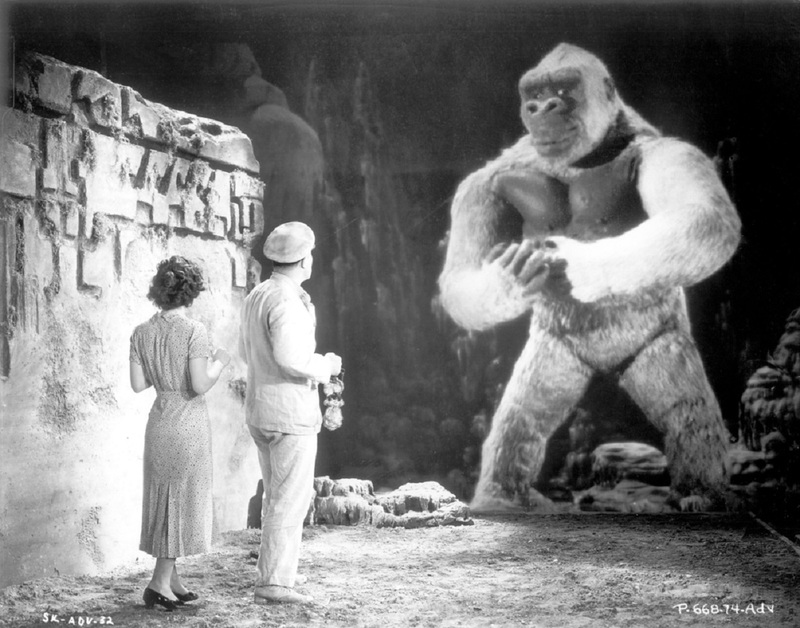 Incredibly enough, considering that it requires a good number of time-consuming stop motion animation effects, The Son of Kong was released only eight months after King Kong hit theatres. The result is a slight and forgettable, although not unlikable, effort. Most fans of the original view The Son of Kong genially and then quickly forget about it. It gives the strong impression of not being too much more than a quickie designed to exploit King Kong. It is only 60 minutes long – and it is 40 of these before we reach Skull Island and 45 before we meet the title character, unlike King Kong, which had maybe 20 minutes build-up. The early scenes are definitely padded with drama about mutinous crews and a good deal of light comedy concerning Carl Denham and his creditors, even performing monkey scenes. What fails to grant The Son of Kong any classic stature is the way it is played. King Kong was a monster movie fairytale about a primal beast being brought down by civilisation; The Son of Kong merely plays Kong’s son for maximum cuteness. Willis O’Brien’s stop motion animation is put to the service of cuteness – scenes where Kong Jr has his hurt finger bandaged, where he shakes coconuts out of a tree for Helen Mark, where he accidentally fires a rifle. There are even comedy sound effects when he bumps his head. Instead of a classic, what we have is a film pitched at kids. There are a few moments that remind of the ferocity of the jungle scenes in the original – like the fight with a bear, although a fight with what looks like a brontosaurus made out of pipe cleaners looks shabby and rushed. The film climaxes with the old lost world chestnut of Skull Island being drowned, where Kong Jr goes beneath the waves in an heroic sacrifice – although this hardly amounts to a tragic sacrifice on the order of Kong being shot down by biplanes in the original. The opening credits note that the film is a proud supporter of the NRA!!! (although further research shows that this is not the infamous National Rifle Association but the National Recovery Administration, which was part of Franklin Delano Roosevelt’s New Deal, designed to create codes of fair workplace competition).